Deep within the Scarred Region Vulter nests can be found. The four to five eggs soon hatch into juveniles. The juvenile Vulters pick at the carcasses of their mother's kills, stripping away at the meat and carefully studying the tendons, muscle insertions and connective tissue. Due to their lack of ability to move their eyeballs, they quickly flip their heads back and forth, presenting the object of interest to each eye. The unique skin on their head and beak makes it near-impossible for infection or disease to cling to Vulter, and adaption that is quite useful in their juvenile state. 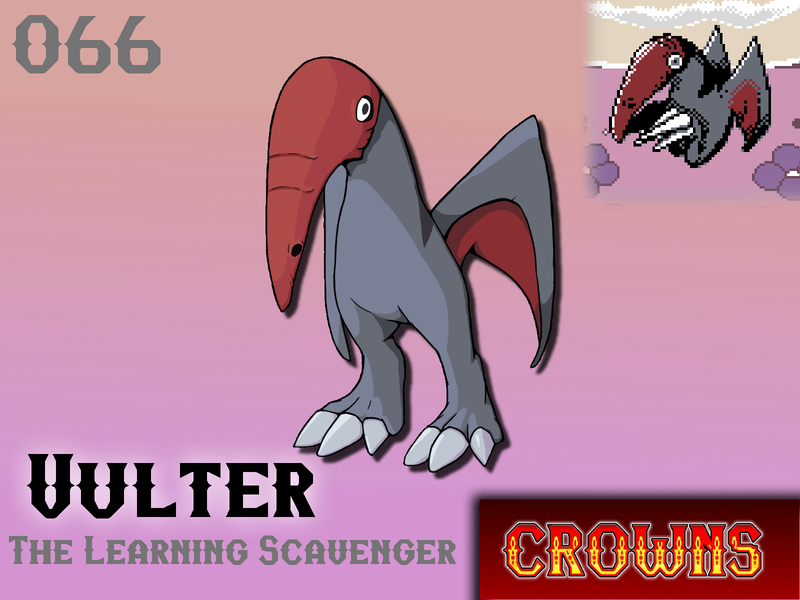 As Vulter grows, they move onto live prey, using their surgical-level knowledge to quickly disable a foe by severing a few vital tendons. Shockingly, Vulter pose little threat to humans. Our strange, upright bodies defy their early knowledge, making them interesting and loyal monsters to the budding Tamer. Will Vulter make your team?